Mostafapour, A., Ebrahimpour, A. (2017). The Effect of Two-stage Heat Treatment Temperatures on Initial and FSSWed Properties of TRIP Steels. International Journal of Iron & Steel Society of Iran, 14(1), 1-9. A. Mostafapour; A. Ebrahimpour. "The Effect of Two-stage Heat Treatment Temperatures on Initial and FSSWed Properties of TRIP Steels". 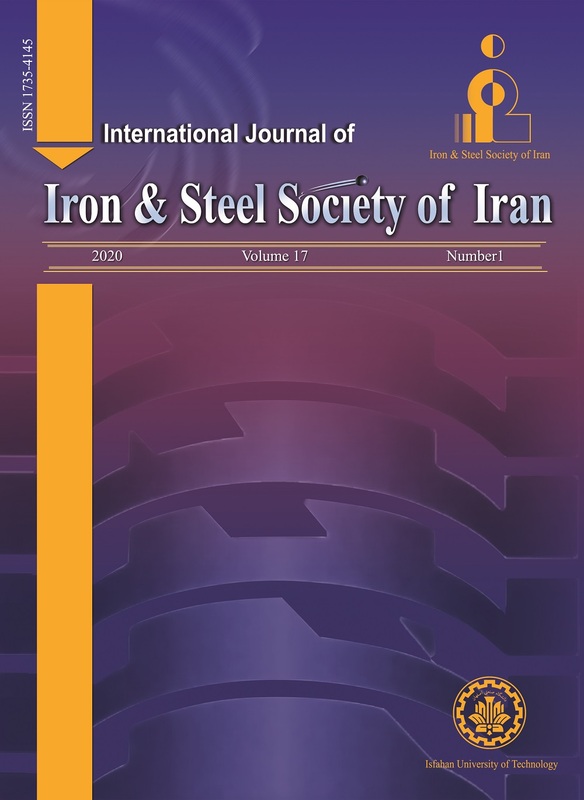 International Journal of Iron & Steel Society of Iran, 14, 1, 2017, 1-9. Mostafapour, A., Ebrahimpour, A. (2017). 'The Effect of Two-stage Heat Treatment Temperatures on Initial and FSSWed Properties of TRIP Steels', International Journal of Iron & Steel Society of Iran, 14(1), pp. 1-9. Mostafapour, A., Ebrahimpour, A. The Effect of Two-stage Heat Treatment Temperatures on Initial and FSSWed Properties of TRIP Steels. International Journal of Iron & Steel Society of Iran, 2017; 14(1): 1-9. In this paper, a 0.2 C–1.6 Mn–1.5 Si wt. % TRIP-aided cold-rolled steel sheet was fabricated and the optimal heat treatment conditions (Intercritical Annealing “IA” and Bainitic Isothermal Transformation “BIT”) were investigated to maximize the volume fraction and stability of the retained austenite. The effects of temperature on IA (770, 790 and 810 ºC) and BIT (330, 350 and 370 ºC) were studied via optical microscopy, SEM and XRD. Its tensile properties and formability were also evaluated. It is obtained that under conditions of 790 ºC /330 ºC and 770 ºC /350 ºC, the maximum and minimum amounts of the retained austenite resulted in a microstructure. Also, for the case which heat treated under 790 ºC /330 ºC condition obtained the best formability by showing the highest elongation ( more than 40%) and the case that heat treated under 810 ºC /350 ºC condition had the highest tensile strength (more than 800 MPa). The cases with the maximum (12.1 %) and minimum (8.1 %) volume fraction of the retained austenite were chosen to investigate the effect of initial microstructure on weldability of TRIP steels. Therefore these cases were joined by friction stir spot welding process under the same welding parameters. According to the microstructural observations, four different zones determined in the welding region: stir zone, thermomechanically affected zone and high and low temperature heat affected zones. It is obtained that the steel with higher amount of the retained austenite in initial microstructure shows better mechanical properties before and after FSSW process because of higher amount of the retained austenite which causes TRIP effect.